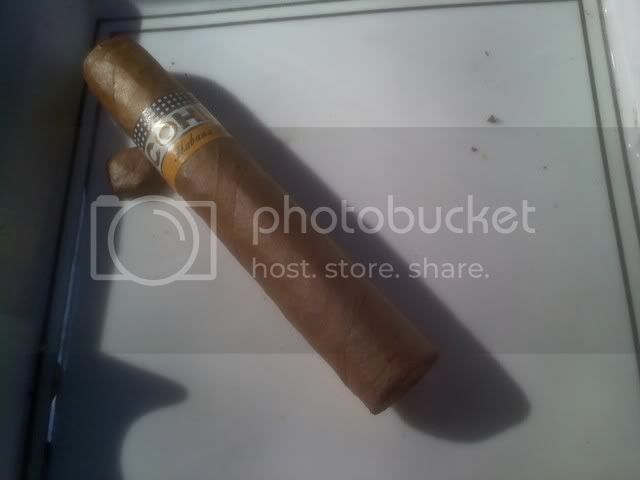 It is a fantastic day outside, and I have decided to smoke something sort of special to enjoy it, the Cohiba Siglo I. In all fairness, this will be my first experience with the Cuban Cohiba brand. Needless to say, I'm excited to see if this little minuto lives up to the brand name hype. The Cohiba brand is certainly one of, if not the most, well known cigar marcas to come out of Cuba. The Siglo line is a series of 6 sizes, ranging from this half corona up to the massive canonazo Siglo VI, with pretty much everything in between filling out the other 4 sizes. This cigar features a golden caramel colored wrapper, with a fine hairy tooth all over it, and a slick oil sheen to it. The wrapper features only a fine network of veins, and no blemishes or sunspots. The construction is fantastic, featuring a well lined triple cap, and tight, straight seams. The foot offers a fine, bready toast aroma, with just a slight floral nuance, as well as a hearty tobacco scent. The cold draw is just slightly snug, and offers a wide range of subtlety, from acidic citrus and grass flavors, to smooth cream and chocolate. The Siglo I lights very easily, toasting in mere seconds, and immediately offers a big blast of smoke, and flavors of sweet cream, dark chocolate, and a touch of citrus and grass, with a dash of a spice bite on the finish. This cigar is impressively well balanced even right here at the start. The first third brings cocoa and black coffee core flavors, with citrus and floral dashes here and there (especially through the nose), and a delicate cream undertone to everything ties it all together. The burn is fantastic, never wavering. The draw is just a hair tighter than medium, and produces massive amounts of smoke. The ash holds well for just about the entire first third, and falls, leaving a clean, straight line, in a big chunk into the ash tray. Getting a few draws into the second third, the basic flavor profile remains the same coffee and cocoa core, with floral and citrus notes, but with the addition of a dark, woody element. The creamy texture, flavor, and overall feel to this cigar still serves to just accentuate the subtle nuances, and really set this one a bit beyond other cigars it's size, which in many cases just do not have time to achieve this sort of complexity. The spicy finish initially present sort of comes and goes, never lingering for long, but popping in just to make sure you are still paying attention every once in a few draws. In the final third, the only real change is that the stick starts to get a little hot which is likely just due to the size, ring gauge specifically. The burn and draw have remained consistently great throughout, and the flavor profile, while not changing a whole lot, has retained a level of complexity that I have never gotten, and never expected to get, from a cigar of this vitola. Ended at 2:40, for a total smoke time of an hour. This, admittedly, was smoking pretty slowly, likely slower than many people would smoke a cigar of this size. Perhaps the only real downside to this cigar is the cost. At 7 or 8 dollars each, they are a bit steep for the size, and resulting smoke time. For me personally, however, the vitola is actually one of my favorites, and the cost is worth it to have some of these on hand for when I want something special, but small. Sounds delicious, I've never had a Cohiba because they're so expensive but this sounds like it might be a good special occasion smoke for me. Great review, doc, as usual. what year was this Siglo from? No idea. Got it in a sampler. Mmmm I must try this. The isom cohiba siglo II was one of the better cigars I have smoked. Thanks for the review.